Happy Halloween! I hope you all had a wonderful day! Here are some pics of my boys from tonight. 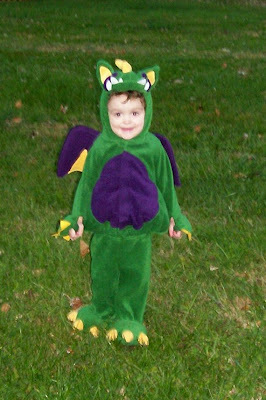 Aaron was the cutest dragon ever. I LOVE this costume! Its an Old Navy costume, but I bought it secondhand for $5. I can't justify spending $50 on something my boys will wear for an hour. Aaron is such a stud. 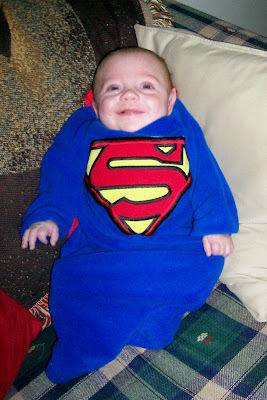 And here's Superman! He's so gorgeous. Isn't he getting big?? I weighed up the other day and he was up to 11 pounds! 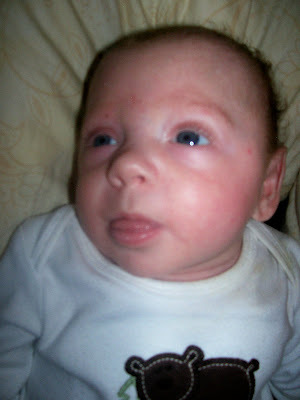 You'd never know he was a preemie. We went to a party at the church and it was tons of fun. Aaron had such a good time! They played games and had prizes and he of course came home with a HUGE bucket of candy which he wanted to take to bed with him. ;) Alex didn't make it at the party too long. It was just too loud so Jamie took him home. He's been sleeping all the way through the night this week-last week he slept from 8-5! Thank goodness! I've been a zombie for too long, so hopefully things will get semi-normal again. I'll be starting to watch my friends 2 children on Monday-Aaron and I are so excited! I hope you all had a safe and fun Halloween! Check back soon for some layouts that I finished! I came across this page during one of my blog runs. I think this is such a great idea! 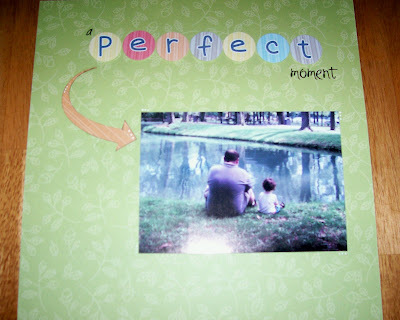 Pages for Preemies. I'm going to work on a few pages this week to send! 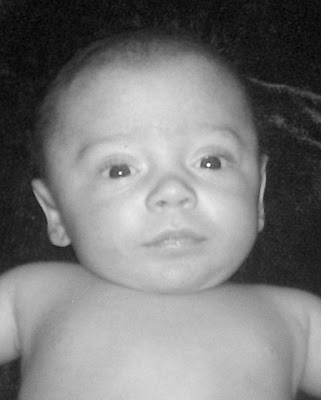 The 22 days that we spent in the NICU were heartbreaking. 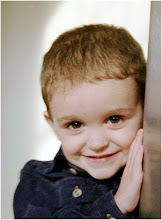 Its terrible to sit and think about some parents who never get to experience bringing their sweet baby home. I absolutely can't imagine. 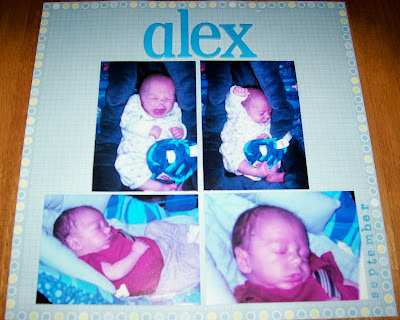 Alexander was in the NICU simply because he was so small-3 pounds, 9 ounces at birth-but since he was born so early because of my pre-eclampsia, things could've been much, much worse. I thank God everyday that he is home and healthy and getting might chubby. Anyway, please click the link above and check the site out! Have a great day! My guys are so stinkin' cute! Happy 3 month birthday, Alexander!! I do have another layout to show you, but the light in here has been terrible and I can't get a good pic. Instead I thought I'd share some other goodies with you! Here's Aaron!! 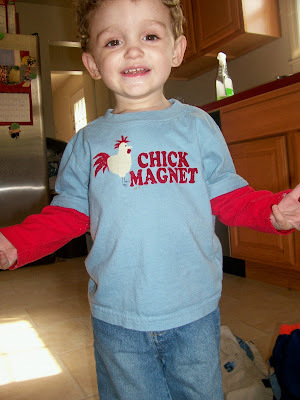 The shirt fits him to a tee. 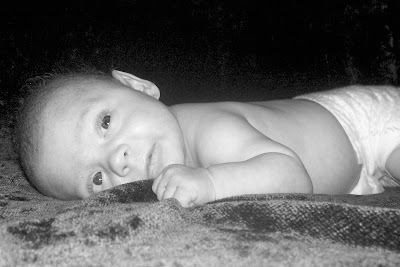 :) And here's the sweetest, cutest baby in the whole world! Alexander is 3 whole months old today! It never ceases to amaze me how fast time flies! Alex is already 3 months old, and last week Aaron was 2 and 1/2 years old! I'm so crazy in love with these two little munchkins! Have a great day! I haven't posted in a month...I'm such a bad blogger! Life has just been so hectic! Alexander will be 3 months old this week. I can't believe how fast time has flown by. I'm going to blink and it will be Christmas already. I got to scrap yesterday for the first time in about a month. I only worked about 3 hours, but it made me feel so much better. Here are some pages I finished: I LOVE this page!! I've been dying to use these penguins! I started by detail cutting my little man out. Isn't he the cutest? 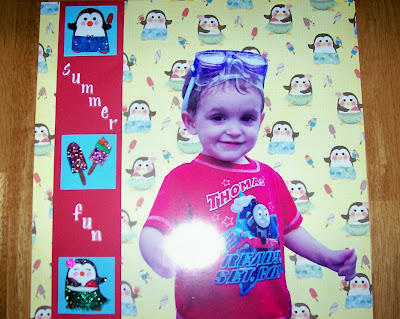 Then I stamped, colored, cut and Stickled the images. They are all FULL of glitter! I don't get to use my Stickles much in the boys albums, so I may have went a little overboard, but that's ok! I'm happy! The cardstock came from my scraps, and the letters are some that I've had for years. Seriously, I think this is my favorite page EVER!! Ok, maybe not-I like this page too. ;) Not just for the page, but for the picture. I took it a few weeks ago at our church picnic at Clearbrook Park. Aaron loves to swim-he would live in the pool or the bathtub if we let him. He's always been a water baby. He was kind of pouting here because his mean daddy wouldn't let him "swim" in that dirty, nasty water! I just love this pic of the two of them. The paper and the "perfect" are from the SEI Doodley-Doo Boy line that I got at CKU 2 summers ago. I've been saving it for something, so here it is! The other letters are Making Memories rub ons. I cut the arrow out from a template that I got at the Dollar Tree. The Dollar Tree is awesome. Here's my sweet little Alexander. He's so gorgeous I could just stare at him all day long. Even though he STILL isn't even close to sleeping through the night and I am beyond exhausted, I love getting up and cuddling with him in the middle of the night. The house is quiet-no crazy big brother running around or anything to do-its just me and Al. I might be sad when he does start sleeping at night! Really simple page. I used Pebbles Inc. papers, K & Co. chipboard, and some Studio G stamps from the $1 bin at M's. The ink I used is from a 12 color stamp set from Paintbox that I got at a yard sale. It was unopened and I got it for $1! I LOVE yard sales!! I did most of this page last month at Happy Scrappers, but never got to finish it. That Aaron is such a stud muffin. 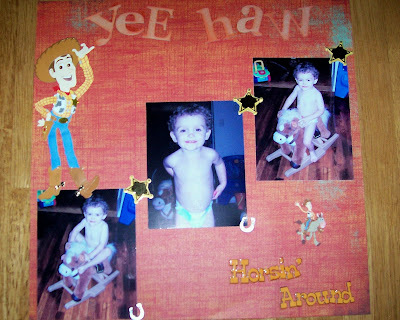 ;) All of the Woody items and the "Horsin' Around" are all EK. The paper is Basic Grey and the letters are just miscellaneous chipboard letters that I had left over from other things. I sponged some ink on them-Studio G again from the $1 bin. Have any of you tried those? I picked up a few not expecting much, but I really liked them. Nice and juicy. Plus you can't beat them for a dollar! I'm looking forward to a nice week at home with the boys. Might scrap again this week if I can get the boys to nap at the same time, but that normally never happens! I will start watching my girlfriends 2 kids at the beginning of November, so I'm going to take full advantage of all of this time with just my precious guys. I hope you all have a great week. Thanks so much for stopping by!